About Those Walks in the Park . . . . I gathered together a collection of old short stories this morning — several of them are online here — for a first shot at Amazon e-publishing. Of course, nothing goes smoothly. Files archived from earlier than Word 2003 days were refused by my copy of Word 2007, and to get them, I added to the laptop (because the desktop is stuck today at XP-Service Pack 2 and won’t load Service Pack 3 required to make the latest WordPerfect demo feel happy and at home) the latest from Corel, which read those old files like a champ and even recovered a favorite — I’d have hated to re-key it, and that’s if I could find a hard copy around here — from WordPerfect 5.0 days (when I wasted my life producing more than 250 macros for that package). From recovered file –> plain text, eliminating all carriage returns and indentations, a part of the by-the-book preparation for a Kindle book –> Word 2007 document of about 60 pages chewed up some time. There are next steps (or course), and I dread them, but, you know, maybe that old stock will move! My printer, an HP B9180 has been begging me for more ink, so it may continue checking out its nozzles. Don’t do the math ($40 per cartridge, seven cartridges, at least one or two turnovers a year just idling — no printing). Is it time to pull the plug and say goodbye to those nifty Vivera inks? The truth is I need print buyers, and I haven’t seen none of those ’round these parts for a long time. On to my other life among more than 500 Facebook buddies from Riyadh to Lahore (with anchors in Jerusalem, I guess): on most days, I’m at least as engaged with Pakistan’s issues as I am with Israel’s. The two interests actually go well together because whether engaging issues in development or peace, the challenges in both regions flow back to mentality and the character of a civilizational consciousness, self-consciousness, and conscience. Really, it’s amazing what one nimble mind can do from a remote desktop planted in a corner of nowhere in particular. Then — if I care to get outside at all during the day — it’s time for my walk, and that’s what I’ve been posting here. Even that — which coat? which hat? which gloves? where’s the travel mug? — has become a complicated ritual: but not for nothing the vaunted “man bag” (L. L. Bean, “sea washed canvas guide bag”). At least the Lumix and driving glasses (spare battery, spare card, cell phone, notebook, etc.) are docked in one place. If I were living in New York City and going about each afternoon with a camera, I’d be one of the city’s street photographers, and what a different scene that would be. On the other hand, my confession: I avoid shooting people. Possibly, after a Facebook peace chat or two, I might be a little tired of them. — but it would take the imprimatur of a publication to shoot candid photography involving people I don’t know (not to mention noting data for captions). Progress happens nonetheless, and indeed I feel enlivened for the hour outdoors, even younger. 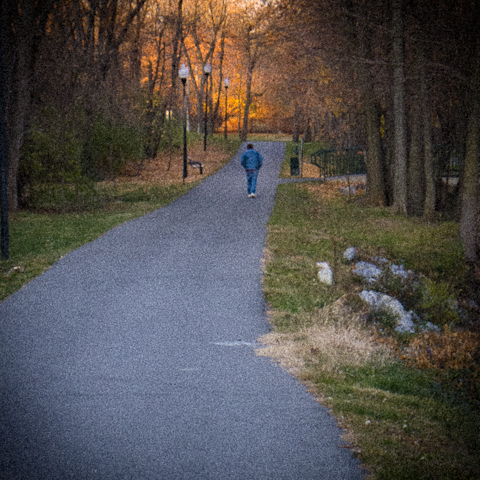 In that the walk may lead to jogging (whispered: God forbid), and improvements in “fitness level” to committing time to excursions, there might be a new ecology developing around this photography thing: I am, after all, looking for public and private gardens and parks, large and small, for photography in the mid-Atlantic U.S.A., for it’s always a great thing being out in weather with a camera in a New World, whether one close or far. End of day: I spoil the ascetic good health by taking it to a restaurant afterward, or, to spare the expense, indulging in the glass of wine back home and fixing up something hot and close to sinful. All in all, the routines are not bad. In fact, they’re pretty good. Still, I need — perhaps you do too — a few more local and regional destinations. Such would be good for the soul as well as the photography. This entry was posted in Journal and tagged 2012, art, journal, November, personal ecology, photography. Bookmark the permalink.